More information: A deluxe 4 disc clamshell boxed set edition of the classic 1979 album Sides by Genesis founder member Anthony Phillips. 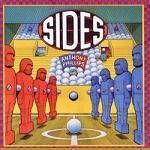 Produced by Rupert Hine, Sides was Anthony’s third solo album and was a superb blend of instrumental music and songs. The record saw Anthony supported by an able cast of musicians that included Mike Giles & Mel Collins (King Crimson), John G. Perry (Caravan, Quantum Jump) and John Hackett (a member of his brother Steve’s band). Featuring such wonderful compositions as ‘Um & Aargh’, ‘Sisters of Remindum’, ‘Bleak House’, ‘Lucy Will’ and ‘Nightmare’, Sides is a classic album of the late 70s Progressive era. This deluxe edition features a new stereo mix of the album, a newly re-mastered version of the original album stereo mix and a CD of demos, out-takes and extras. The set also includes a DVD (NTSC – Region Free) of a new 5.1 Surround Sound Mix of the record and a lavishly illustrated booklet with a new essay by Jon Dann featuring interviews with Anthony Phillips and Rupert Hine (the album’s producer).